What size of car are you driving? Which size of car are you driving? I drive coupé - my car is Skoda Rapid from '86 equipped with 1.3-litre engine. But believe me, it is not sporty at all. I think I just killed its dampers when I drove here to Hungary through Baltic countries, Poland, Czech Republic and Slovakia. It are just 2 totally different types of cars. I am aware of this. How would you differentiate? I interpret micro as smaller than compact. This means also that the Renault Twingo and the Renault Clio belong to the micro category, while the Renault Megane represents the compact class. Maybe we need a "small" category between micro and compact. Any idea for a proper nomenclature? Renault Twingo and Clio are just huge compared to, for example Fiat 126. How would you classify this? A doghouse on wheels? Kedvenc állatam a hörcsög; ha rálépek, szörcsög. Small car = Renault Clio, in some ways also for example Audi A3 except its interior and size is huge compared to cheaper cars. There are as many classes of cars as there are models, so this is all just personal opinions. But Aaron, if you got a car like that in the picture, it would be really sporty! That car is probably straight from an Eastern Europe race track! Osku-82 wrote: But Aaron, if you got a car like that in the picture, it would be really sporty! That car is probably straight from an Eastern Europe race track! It is a socialistic sportcar. Under the front lid there is a plate which says "Automobilove Zavody Narodni Podnik" and "Made in CSSR". This means "Car Factory Property of People" and CSSR is Czechoslovakian Socialistic Republic. I bought a boring car last week; Toyota Corolla 1.3 XSi '91. But it runs and that is what matters. It's very impressive sitting in the other end of the train in a quiet night and seeing all the curves and hills inside the train. Really. Seeing a hill in middle of a train is quite impressive. The Berlin U-Bahn really seems to have a _lot_ of hills. Two cars, both Fiats: a white Uno for shopping, town use, etc. (easy to park) and a light blue Marea Estate for long trips and holidays. Aaron wrote: I drive coupé - my car is Skoda Rapid from '86 equipped with 1.3-litre engine. But believe me, it is not sporty at all. Oohhhh, when I was young, this was the car that I wanted. I know it's an old Skoda, I know the engine is in the wrong place, I know it's a very oldfashioned car, but I loved to have one. MDeen wrote: Oohhhh, when I was young, this was the car that I wanted. I know it's an old Skoda, I know the engine is in the wrong place, I know it's a very oldfashioned car, but I loved to have one. By the way, I'm trying to sell the car - €200 and it's yours. The MOT has expired and there is something little to fix but nothing radical. This looks nice - a bit newer than the Columbo model. I bet it has been designed by Italians. Is it Pininfarina, Italdesign or Bertone? I guess Pininfarina. BMW's have ancient rear-wheel drive, ancient emissions and ancient exhaust sounds. Maybe there's your next car? They are widely available in Finnish used car shops. Aaron wrote: I bet it has been designed by Italians. Is it Pininfarina, Italdesign or Bertone? I guess Pininfarina. And I once read about the Skoda that it was best driven with a heavy bag of potatoes in the front, otherwise the steering is a bit vague. Am I correct in thinking that the front lid opens sideways? Osku-82 wrote: BMW's have ancient rear-wheel drive, ancient emissions and ancient exhaust sounds. Maybe there's your next car? They are widely available in Finnish used car shops. I don't like BMW's. The biggest engine I have ever had in my car is 1.3 litres. That is just enough as I don't have a caravan. Besides, BMW's are not rear engined (apart from BMW 700 of which production ended in 1960's). A rear engined car is just fantastic on small, narrow and curvy roads. Everyone who has driven a rear engined Skoda on sandroads knows what I'm talking about. Yes, it really looks Pininfarina. I like their design very much - Ferrari 250 of the same age as your Peugeot is one of the most beautiful cars ever made. Have you ever heard of Mazda 1500/1800? 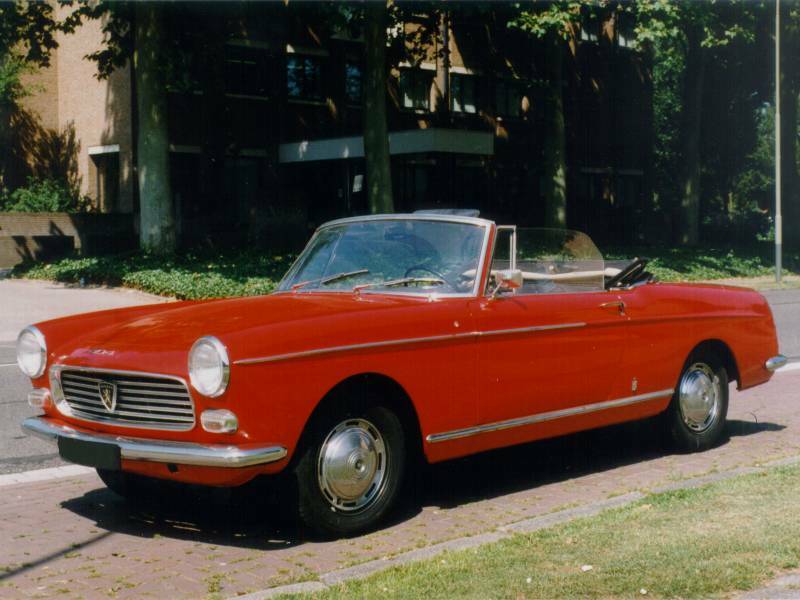 The model is designed by Pininfarina in 1960's and it is the most beautiful family car I know. There is also a coupé version with a wankel engine and that is almost as beautiful as Ferrari 250. Well, maybe in a different category. Just a perfect car - Italian design and Japanese quality (if it was other way round that would be a nightmare ). MDeen wrote: And I once read about the Skoda that it was best driven with a heavy bag of potatoes in the front, otherwise the steering is a bit vague. Naah, you don't need it if you are not afraid of little side wind effect. MDeen wrote: Am I correct in thinking that the front lid opens sideways? Yes, in the last rear engined generation (models 105/120/130/135, 1976-1989) it opens sidewards. It is very useful when you load some luggage. People also say you can use the front lid for "surfing" home by the car if your engine is damaged.